Michel Samaha, the name was once enough to bring smiles to people’s faces. Michel Samaha “knows everything about everything”, according to TV interviewers. He is also a “plots detector”, especially plots prepared against the Syrian regime, the same sources described him. His political journey started when he was elected head of the Kataeb Student Body in the 1970's. An apt follower of Bachir Gemayel, then Elie Hobeika, until his appointment as media adviser to then President Amin Gemayel at the beginning of his presidential mandate. 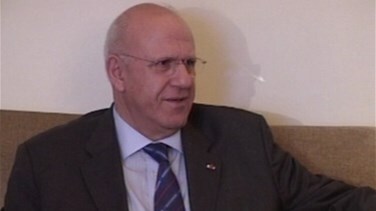 Later, President Gemayel appointed him as the General Director of Tele Liban. From the party of “God, Nation and Family” [Kataeb], Samaha "crossed sides" when he pledged his support for Elie Hobeika during the preparation for the Tripartite Accord in 1985. With the fall of this accord, he left the “Eastern region”, only to return as Syrian tanks entered Baabda under Syria's and France's political umbrella. Michel Samaha made a strong comeback to the Lebanese political scene, as holder of the “Syrian code” and godfather of the Franco-Syrian and Lebanese-Syrian relations. Since the Taef Accord until 2005, he was one of the pillars of the Lebanese political scene. He served as information minister in 1992 and 2003, and was elected Member of Parliament in 1992. Following the assassination of Rafik Hariri, the Syrian role in Lebanon receded, leading to the retreat of the internal role of Michel Samaha. However, his relation with Syrian President Bashar Assad remained.